Livestock Guardian breeds share the same important behavioural characteristics, showing attentive, trustworthy and protective behaviour to the livestock with which they are raised. They are not bred to herd or move the stock, which can trigger a predator to attack, but instead place themselves between the stock and the threat and bark loudly. The mere presence of an intimidating guardian is enough to make the predator leave. It doesn’t happen very often, but if the predator persists, then the dog will attack. But, normally, just the presence of a big white dog will make the coyote move on to the next farm, in search of easier prey. Guard dogs are an important part of the team on a sheep operation, but you have to choose the right breed and raise them properly. What works for one rancher does not necessarily work for another. Choosing the right type of dog or puppy from a litter will make a big impact on your sheep operation. Although Kuvasz have an innate instinct to guard and protect, you can’t purchase a puppy, stick it out with your sheep and expect it to know what to do. Yes, these dogs do have a natural instinct to bond and protect with whatever it lives with, but a puppy does need a certain amount of supervision to make sure it does not chase the sheep or nip at the ears or the butts of the sheep. You want a dog that is confident, but calm…that will walk amongst the sheep without causing havoc gradual exposure and some training is required. A sound and stable guard dog will actually relax the sheep. For example, in British Columbia a client of mine owns a Bed & Breakfast. Their Kuvasz is a “jack-of-all-trades”. She protects the sheep from predators, and helps mama sheep lick their newborns clean. This amazing Kuvasz had reportedly ran in front of a small child that had wandered off, shopping the child from falling into a low wall into a sheep pen. The dog was also very understanding of older guests, and would often walk slowly beside them and let them rest a hand on her for support. A lady from Saskatchewan, who had a flock of about 500 ewes, purchased a second Kuvasz pup from me. 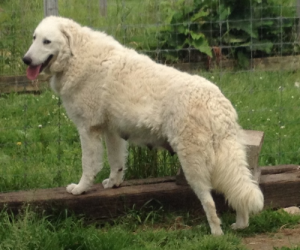 Her flock was too large for one Kuvasz and many of her sheep and chickens were being killed by coyotes. She was hesitant at first, questioning whether investing in a second Kuvasz would be beneficial. Eight years later, I was thrilled to learn that with two dogs patrolling her farm, she never lost a single sheep or chicken again. 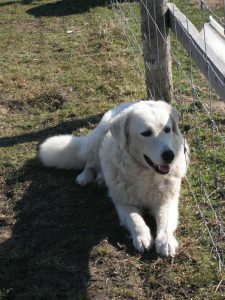 I have many stories about Kuvasz protecting alpacas, turkeys, chickens, goats, cats and children. A family has even purchased a Kuvasz to protect their foals, after their neighbour had a foal killed by a bobcat. 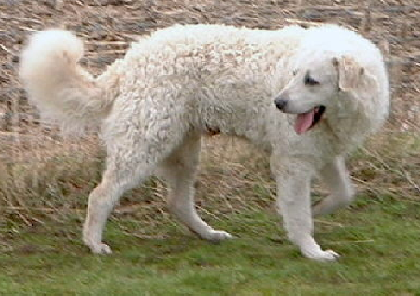 Livestock Guardian Dogs are commonly used with silvicultural workers on the British Columbia reforestation projects. They use about 6,000 sheep per year for their sheep vegetation management work (in an area famous for it’s high grizzly and black bear populations). They used about 50 LGD’s and numerous shepherds, and they pride themselves that they only lost a total of 8 sheep in over a 17- year period.